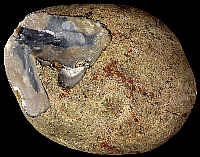 Mode of occurrence: Ovoid pebbles and cobbles (En Lachat), rare fragments of thin (1 cm) tabular flint (Champ Bottu). Colour: Light brownish grey (2.5Y 6/2) with grey patches (2.5Y N5/) at En Lachat, yellowish brown to brownish yellow (10YR 5.5/6) at Champ Bottu. 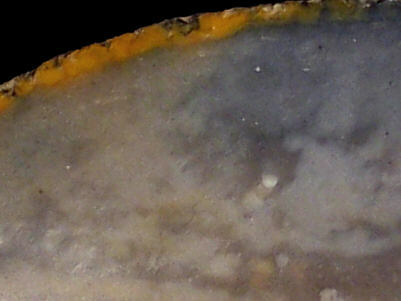 Pattern: Distinctly flecked/spotted (unreplaced matrix, recrystallization haloes) at En Lachat, much less so at Champ Bottu. Structure: A few micro-vugs at En Lachat. Texture: Mudstone with wackestone patches. Matrix: Opaque to subtranslucent in some areas. Grains: 2.5 to 7.5 %, occasionally 20 %, pale, subangular with high sphericity (100 to 400 µ), and long sponge spicules (1000 µ) at Champ Bottu. Grain composition: Numerous foraminifera, showing occasionally as black "ghosts" outlined by impurities (En Lachat), planktonic globose species (e.g. Hedbergella sp.) and biserial forms (Heterohelicidae), numerous thin-walled sponge spicules, occurring as concentrations often surrounded by white recrystallization haloes, echinoderm fragments, a few discrete punctated spheres (250 µ); iron oxides at Champ Bottu. 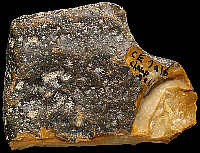 Other types of flint: The flint here constitutes quite a mixed lot, with predominantly Late Cretaceous material like CE1b, CE1c, CE2, CE3, CE4a, CE4b, and CE5, but also Hauterivian (Early Cretaceous) material of the Ht3-type.